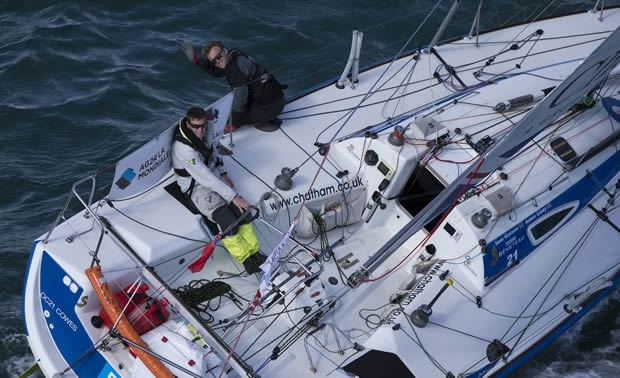 Artemis Offshore Academy sailors Sam Matson and Robin Elsey set off today on their first transatlantic crossing, starting the 3,890nm Transat AG2R La Mondiale. A fleet of 15 33ft Figaro Bénéteau IIs and all sailing double-handed, set off from Concarneau, France at 1308 CET (1208 UK time), heading for St Barts via a mark off La Palma. After a solid start, sailing a very good race around the initial inshore section of the course, Matson and Elsey are now settling comfortably in sixth position. Talented Figarists and pre-race favourites Yoann Richomme and Charlie Dalin, co-skippering Skipper MACIF, took a well earned and expected early lead – now setting the pace as the fleet races into the first night. First timers to this one-design transatlantic race, the Brits are one of four Rookie crews taking part. Ahead of the start the sailors, both from the southwest of England, were in high spirits but understandably apprehensive, preparing to take on the great unknown. “I really just want to get going now,” Elsey admitted as he left the dock. “We’ve packed up the boat with everything we think we might need and have looked at the weather for the first few days, but after that, we’re into the unknown. After fresh conditions in the Bay of Biscay, the fleet will make its way south and eventually pick what are expected to be generally consistent trade winds as the yachts head downwind towards the Caribbean. “We were looking at a pretty wild ride across Biscay, but the winds have calmed a little,” said Matson. “We don’t expect to see much more than 25 knots for the full 3,890 miles of the race now. The first boat could arrive in St Barts as early as Friday 22 April.